I was born in Montreal, Quebec. My parents were highly cultured people; they had a large collection of books on art, music and sculpture. I was a curious child and doubtless my parents’ interests rubbed off on me. My early favorite artist was Marc Chagall. The absence of gravity in his work gave it a dreamlike quality. At Concordia University (then known as Sir George Williams University) I was enrolled in a general BA program, and during my second year I took an art course that comprised sketching, painting, and sculpture. 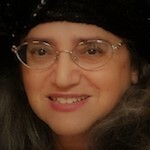 The instructor was a friend of the renowned sculptress Esther Wertheimer who visited the class. Many of her figures were displayed in a state of movement, like dancers always in motion with flowing hair. Her pieces were amazing; I was hooked. My interest in art began with sketching pictures in magazines and newspapers. I dabbled in painting and origami, then finally got into sculpting. Sometimes now I do a sketch or maquette (a miniature model used to preview a larger intended artwork). The artistic process begins in the artist’s imagination and with a combination of aptitude and perseverance it evolves into a distinct artistic piece. 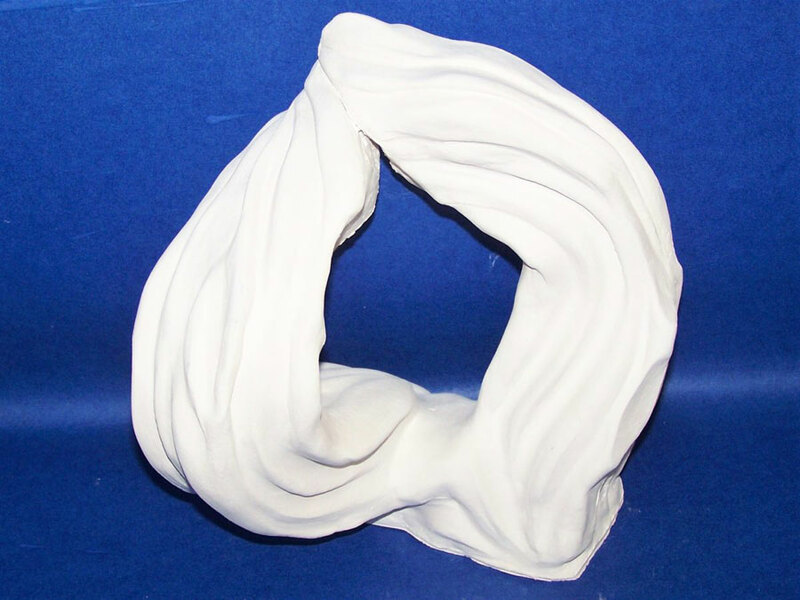 I have been sculpting for 10 years at a local community center close to my neighborhood. The process has changed over the years: I now work with more fine detail. Sometimes I just sketch a rough drawing then work on it in clay. I love the feel of terra cotta. I also work with paper white clay. The terra cotta is very easy to manipulate but chips more readily when fired. 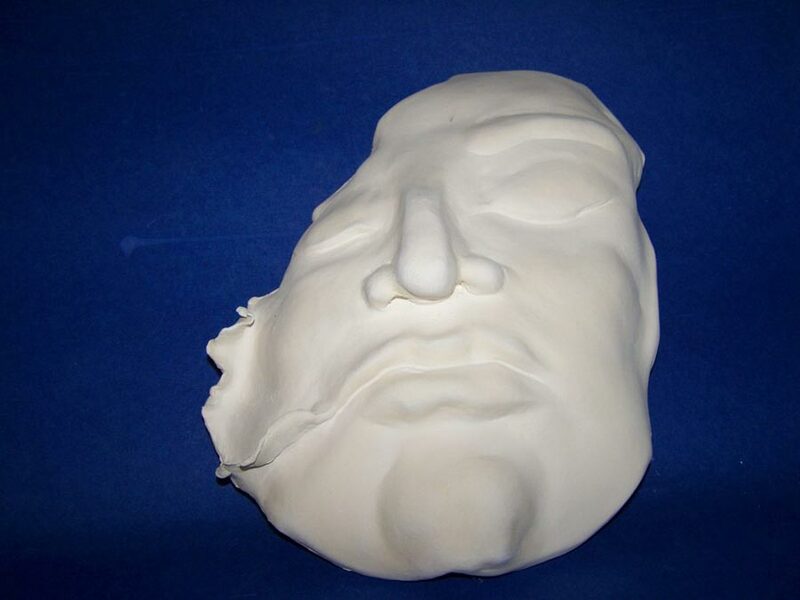 The paper white is a harder but more durable substance. 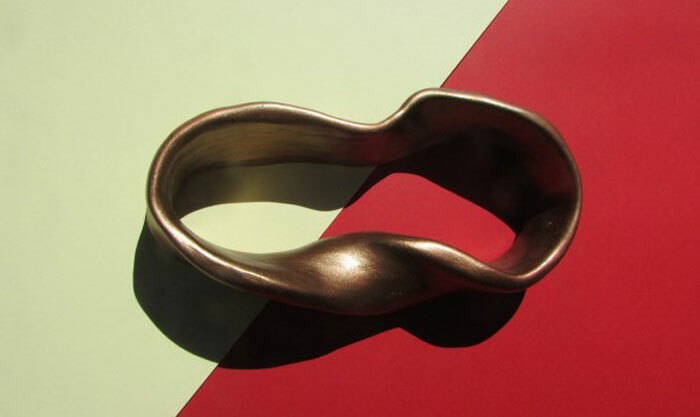 When I fashion mobius strips I usually use a metallic glaze. 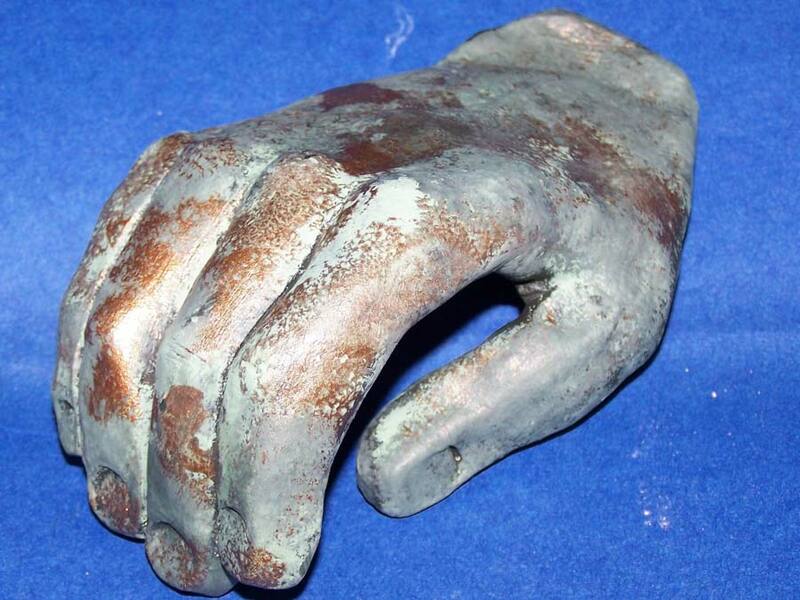 My fascination with hands probably began with my appreciation of Michelangelo’s David. I am also a great admirer of Da Vinci and Rodin. 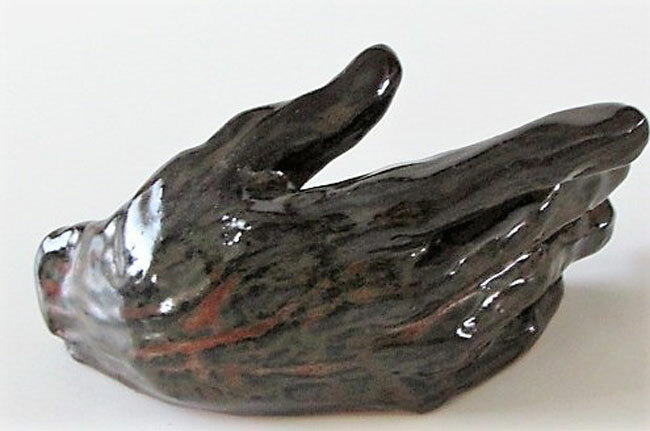 Interestingly, a hand can have opposite attributes: it can show the aggression and strength of a warrior as well as the gentle caress of lovers or of a mother and child. This versatility always intrigues me. 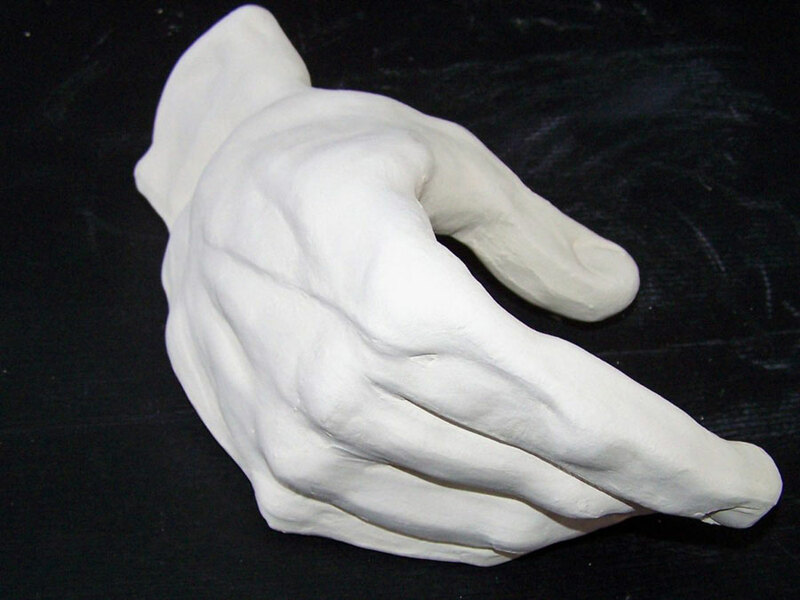 When I sculpt hands I usually take a photo from a magazine or newspaper. Maquettes are also very useful to perceive things in a three-dimensional manner. The hands vary in size but I feel more comfortable now when it comes to depicting enhanced detail such as veins, hand bones and phalanges. When I work on masks, I really try to evoke the essence of the piece, to give the beholder a sense of the person to whom such a visage might belong. Masks conceal one identity while supplying another. The artist adds mystery by showing details on the face of the mask: wrinkled lines on the forehead, the intensity of the eyebrows, the smile or the grimace. The mood is dictated by the artist. 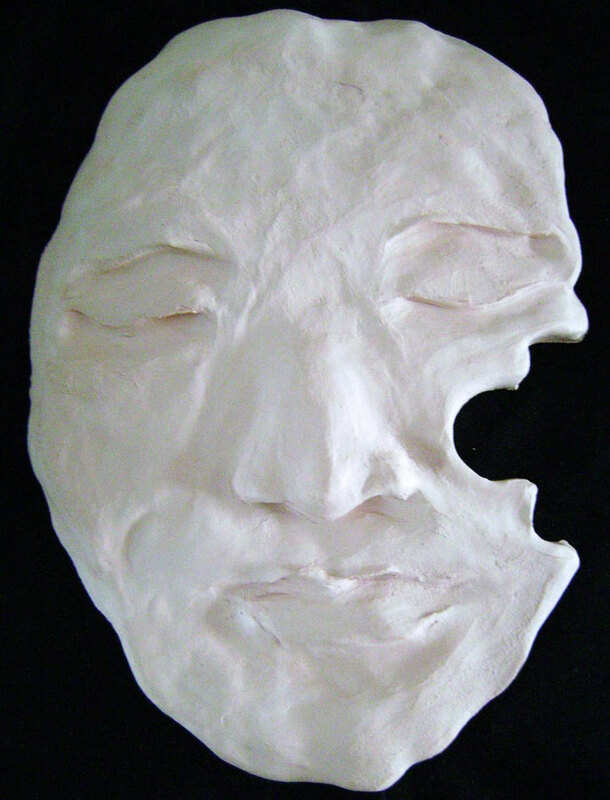 Sometimes an artist aims for aesthetic perfection in creating a mask, but I feel adding some imperfections offers greater depth and complexity. I like to imbue the viewer with a sense of curiosity and wonder. When I work on masks, I like to emphasize different ethnic groups and various ages. I have also created several mother-and-child pieces. When working, I sip my coffee and enter my mellow zone with the music of the operatic group Il Divo or some Josh Groban ballads. It is helpful to enlarge one’s comfort zone with music. This takes tremendous effort for me but I believe it gets easier the more I sculpt. My artistic philosophy is to satisfy my innate need as an artist by practicing my creative vocation/avocation and to improve with time. Shelley Sarna resides in Ottawa with her family. She has had several group exhibitions at the Ottawa School of Art where she currently has abstract work displayed.